Hoogervorst signed in 2002 a three-year contract at Segunda Division club Sporting Gijon. Club Marino loaned him in his first season from Sporting Gijon. His contract was extended with another season and 2005-06 was so successful that he earned a contract at Real Madrid Castilla. The B-selection of Real Madrid plays in the Segunda Division A. Appearing just once during the first half of the season, Jeffrey saw his chances too minimal to continue his stay in Madrid. He made a surprising move to rivals FC Barcelona in January 2007 where he signed a contract until the end of the season. In his contract was an option for another three seasons when his stay was successful for both. Jeffrey joined the reserves of Barcelona, FC Barcelona B. After relegation of the team to the Tercera Division, Hoogervorst wanted to leave the club but coach Guardiola persuaded him to stay. The season 2007-2007 was however not successful again. He suffered from a bad injury and played no matches before cancelling his contract in March 2008. In the 2009-10 season he returned to Club Marino de Luanco to help the club for promotion to the Segunda Division. His former club was just relegated in the 08-09 season. Although good play from the club, they narrowly missed promotion and ended as runners-up in the Tercera Division II. Hoogervorst saw his performances awarded with a move to the Segunda División B where he is playing at Zamora CF in the 2010-11 season. At the end of the season, he moved to Tercera Division club Real Avilés CF on a two-year contract until June 2013. At the end his contract was not extended and he was released on a free transfer looking for new opportunities. 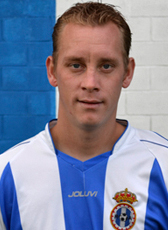 Hoogervorst retired from professional football and joined a Spanish outfit in the lower amateur division.